So this week, I'm featuring two bargain-licious projects that I just love. I simply couldn't choose just one, so I'm featuring two. Click on the images to see their step-by-step tutorials. 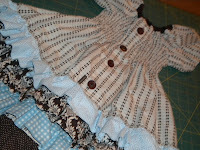 Check out this darling Old Navy shirt dress from The Sew*er, The Caker and The Copy-Cat Maker. I'm also featuring this super-easy Fabulous Faux Frosted Glass transformation from Carolyn at My Backyard Eden. Love it! 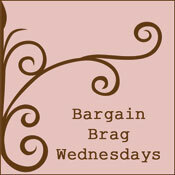 Both of these projects linked-up at last week's Bargain Brag Wednesday.